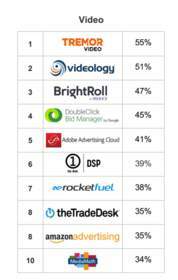 NEW YORK, NY--(Marketwired - Nov 29, 2017) - Tremor Video DSP, the leading programmatic video platform, today announced that it has better brand recognition than other video-focused DSPs, according to a new DSP report from Advertiser Perceptions. Over half of the respondents, which included more than 700 advertisers in June 2017 - 52% from marketers and 48% from agencies, with 49% VP level or higher, identified Tremor Video DSP from among the demand-side platforms (DSPs) available and noted their use of the DSP for video buying. "For ten years, Tremor Video DSP has been focused on the important and growing video segment," said Abbey Thomas, CMO of Tremor Video DSP. "In a crowded marketplace, we're pleased that our customers most associate us with this format." Advertiser Perceptions' most recent poll of advertisers was conducted to understand their plans around programmatic buying, including whether or not the benefits of improved targeting, data, time, and cost efficiencies outweigh prevalent concerns over fraud, brand safety, and verification. Tremor Video DSP's ranking is made more significant by the fact that advertisers still have a hard time distinguishing platforms. "Advertiser Perceptions' research revealed that Tremor Video had the strongest association as a 'Video DSP'," said Andy Sippel, Senior Vice President, Consulting of Advertiser Perceptions. "Given the importance of video in the market, this is an important and strategic asset for Tremor Video DSP." To contact Tremor Video DSP or for more information, you can visit www.tremorvideodsp.com. Tremor Video DSP, the leading programmatic video platform, helps advertisers tell new stories in immersive and engaging ways, building emotional resonance with their audiences. We employ patented all-screen technology to make every advertising moment more meaningful for consumers, and deliver maximum results for buyers. Tremor Video DSP is a Taptica Company.